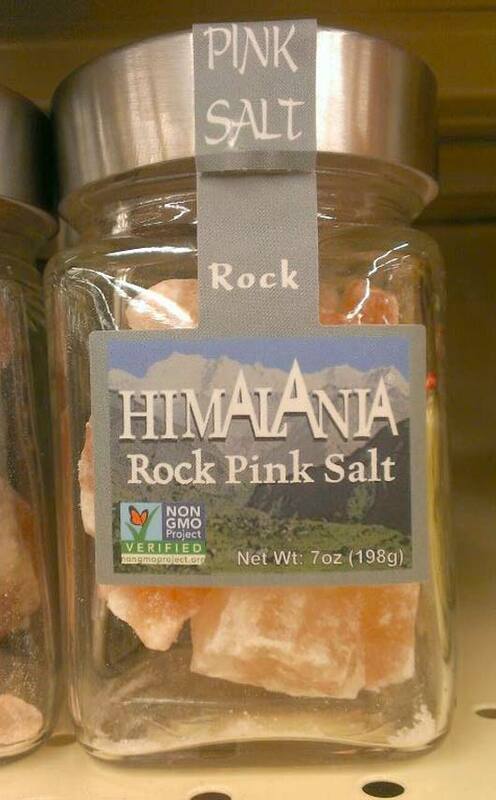 This entry was posted in food, GMOs, organic foods and tagged food labels, GMOs, himalania rock pink salt, hysteria, misinformation, non-GMO certified, non-GMO labeling, non-GMOs, organic food, organic foods, The non-GMO project. Bookmark the permalink. The responsibility of GMO labeling should fall on the shoulders of GMO food producers. They don’t even need to test for GMO since they already know what ingredients they use. It would make so much more sense to label a product as containing GMO, instead of labeling all of the products that do not contain them. Thanks for this article, Scott! I have encountered this sort of thing, mainly from people talking about GMO wheat — when in fact, there is no GMO wheat being commercially produced anywhere in the world. This often brought up in conjunction with the anti-grain, anti-soy, pseudoscientific “paleo diet” propaganda that’s going around lately. Another thing that people should be aware of, is that of the major GMO crops that ARE actually produced and sold in the USA, the overwhelming majority of the GMO corn, soy and alfalfa is used for animal feed. So for most people eating the “standard American diet”, their main exposure to GMO foods is from consuming meat and dairy from animals that have been fed massive amounts of herbicide-drenched Roundup-Ready GMO corn and soy. If you eat animal products and want to avoid GMO exposure, then you MUST eat only USDA certified organic meat, dairy and eggs. Or, of course, you could go vegetarian. Great point about GMO exposure by conventional meat and dairy. I must confess I have a taste for Organic Butter more than any other dairy product. I buy Trickling Springs Organic Butter and it’s the best butter I’ve every eaten. I served it to friends recently to butter their Challah bread during dinner and they went wild for it. My friend then just had to get his hands on that Trickling Springs Organic Butter to serve his family at Thanksgiving. That butter is ridiculously good! But, if I ever see a Non-GMO label on my Organic Butter I’ll have to #facepalm for sure. Great article. I miss the Fage yogurt though. You were the only local store that stocked the full-fat version (the only kind I eat, if possible). I hate when I hear or read people complaining that gluten sensitivity is on the rise because of GMO wheat – there is no GMO wheat! (in the US anyway). So many people think that GMO = hybridized. People have been creating hybrids since the dawn of agriculture. Didn’t you hear about this? Go ahead and trust Monsanto. I don’t. Love, a Mom’s-shopping, organic veggie, pastured beef, pork, and chicken (soy-free!) eating gluten-free paleoista (whose arthritis symptoms vanished after going gf). I had thought that in the US, anything that is labeled Organic must be non-GMO or it can’t be labeled organic. Please be kind to your customers, I think they meant well. Also, while no wheat is GMO in the US, I am finding loads of stuff with wheat snuck into them. I have a straight-up wheat allergy and while gluten-free is a helpful label to start with, i am constantly shocked when those imported gummy worms I bought from the candy shop give me symptoms–glucose syrup can be made from wheat apparently? If it does not say wheat-free i am always taking a chance, and I know it. I also found out that wheat growers will spray with Roundup as a desiccant–to dry out the wheat before harvesting. So there’s no want of a GMO Roundup-ready wheat, they want to spray with that just before harvesting it and feeding it to us. People are trying. There’s so much information out there and sometimes it’s hard to know who you can trust, especially since food manufacturers are slapping “natural” on everything when that means nothing. By investigating the philosophy behind MOMS I know that I can trust that everything in the store is a healthier alternative to commercially manufactured and processed foods. Those who are more educated in the food processing industry need to keep patiently saying the same things over and over again (“organic = non HIM”) until the majority of the population like the gentleman above get it. Really good information. I learned a lot from this blog! This is great – I always love your posts, even if I’m a few years behind in reading them. You didn’t spell out the most ridiculous aspect of this non-GMO label, however. Salt doesn’t even have genes.